Peaceful location, 10-15 minutes walk to the beach. Ideally located between the buzzing medieval Old Town of Budva and the famous picturesque Sveti Stefan. Nestled up against the mountain side, just 10-15 min walk from the sandy Becici beach, the villa offers the best of both worlds: peaceful breathtaking panoramic views of the bay and the surrounding mountains while at the same time just a stroll away from lively cafes and restaurants. In close proximity, are two 5 star hotels where one can indulge in gourmet cuisine and be pampered in luxury spas. A great family holiday spot, that is particularly child friendly. Further details: Close to the house (about 300m) there are two small convenience shops for your daily needs, but we recommend great food market in Budva, where you can buy lots of organic products sourced from local farmers. Becici, Sveti Stefan and Budva have banks, medical centres and tourist information centres, as well as dozens of coffee shops, bars and restaurants. The best night-life is found in Budva. Close to the house there are two 5 star hotels that provide luxurious spas for your pampering and indulgence. The Adriatic is regarded as one of the world's clearest seas, so indulge in scuba or snorkelling. Travel: Tivat Airport is about 25 km away, Podgorica airport 50 km and Dubrovnik Airport about 120 km away. Flights from the UK to Dubrovnik are frequent (try Thomsonfly, Flybe, Ba and Croatiaairlines). Summer flights to Tivat from Heathrow and other European airports are ideal given proximity to villa (check BA, JAT, Montenegro airways). Port of Bar is 38 km away. The last 100m of the road to the house is a dirt road that is awaiting renovations by the municipality before the summer season. Car hire is recommended. Many cheap internet car rental offers are available. Distances: All the major sights of coastal Montenegro are within easy driving distance: Budva, Sveti Stefan, Petrovac, Prcanj, Kotor, Perast, Herceg Novi, etc. The ancient capital of Cetinje can be reached in just over an hour by taking the breathtaking, hairpin mountain road. Skadar Lake is less than 30km away from the villa. We have few coffee makers including Nesspresso coffee maker with milk frother. Unfortunately it's not easy to buy Nesspresso capsules in Montenegro, we recomend for coffee lovers to bring their own. The booking of the villa couldn’t have been easier. Whilst on holiday we well looked after by Jovan who couldn’t have been more helpful. The house comfortably slept both our families and provides numerous options/ balconies for dining outside. It was a lovely introduction to Montenegro with so many wonderful beaches and coves a short distance away. La maison est spacieuse et bien equipee. Elle est tres comfortable. Elle est proche d'endroits magnifiques (Budva, SvetiStefan). Le manager, Jovo, etait toujours disponible a nous aider ou repondre a nos questions. Notre sejour fut un plaisir. Had a wonderful holiday with friends and family in this beautiful, large house. The well-designed home allowed everyone to enjoy their own space with gorgeous terraces that overlooked the bay. The kitchen was functional and had everything we needed. The manager, Jovo, was extremely helpful in organising lifts, giving information and helping to book some short trips. A great spot. We were a group of 8 and the villa felt massive for us! it is an amazing space and we loved every part of our time in the villa and Montenegro. It is perfect as a base to explore Montenegro and Kotor if you can bring yourself to leave the villa. The pool is an ideal size and there are so many places to sit and relax in the sun between all of the terraces you will never get bored. All together a 5 star villa, would highly recommend to anybody! So, where do I begin? Well, that we had an absolutely amazing time. We stayed for a week in July 2016 -- my husband and I, our two teenage kids and my dad. 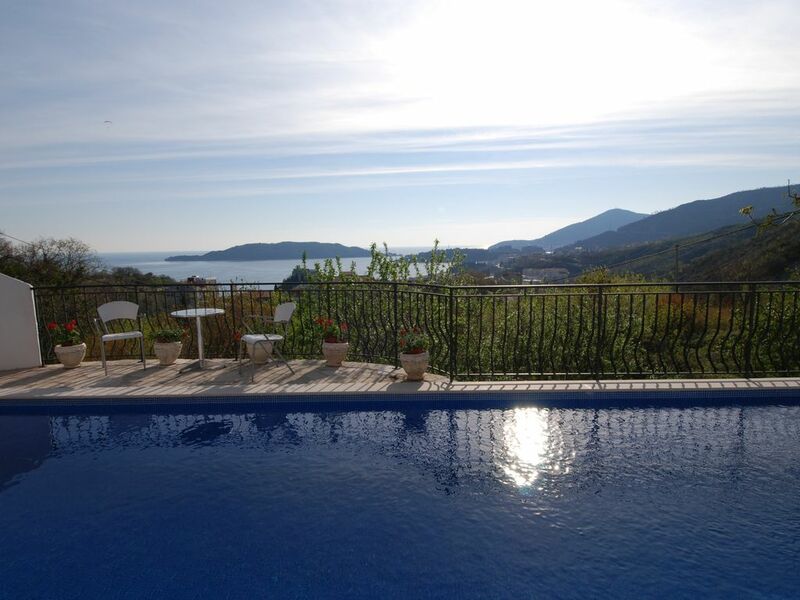 Despite the HORDES of tourists in Budva, Kotor and Dubrovnik (so go early to any of these places to beat the crowds), this villa provides the peace and calm every vacation needs. We took advantage of cooking fresh fish at the lovely stone grill (stop at the fish market on the way from the ferry to the villa -- much better than the fish market at the Budva mega market), daily swims in the pool with fantastic views of the sea, peaceful reading on the many terraces throughout the house (so many nice environments to choose from). And Montenegro itself is an adventure -- We visited Kotor, drove the whole bay, swam in Kotor bay, drove to Lake Skadar and returned via a very picturesque mountain road, ate at the lovely Konoba Catovica Mlini on the bay, immersed ourselves in the country's great wine, honey and Prsuit. Maja was fabulous (even tho we didn't personally meet), esp considering we had a few travel bumps that she worked through with us. House manager Jovo met us to take us to house and give us lay of the land. I hope we return to Montenegro someday!!! Thank you Shirley, I am glad that after a long and bumpy ride we were able to accomodate you and make your well deserved holidays enjoyable. We are a family of 5 with teen age children.we arrived at the beginning of June. It was our first time to Montenegro. It could not have been a better vacation. The owner Maja, is extremely responsive and helpful. The house manager greeted us and led us to the house. The level of client service was very high. When we arrived we had everything we needed. The house is beautiful Clean well appointed and very spacious. We loved the kitchen, patios and large living room.The outdoor patios and pool are welcoming comfortable and private and allow for extraordinary views. We were a short drive to the beach and restaurants where there are a host of water activities available. It was the perfect combination of beach vacation and cultural touring- Kotor, the monastery at Ostrog and Skadar Lake.The villa is perfectly located to allow for both. We appreciated the small market just down the hill from the Villa. The house manager gave us very good restaurant re I mendacious. We also discovered the Aman resort and beautiful beaches of Svet Stefani. We highly recommend this villa . Thank you for taking the time to reflect on your holiday in Montenegro and sharing it with others. We appreciate and thank you for your feedback and hope to see you again sometime in the future! The villa is nestled up against the mountain side, just 10-15 minutes walk to the famous sandy Becici beach (1950m long), proclaimed as the most beautiful beach in Europe. It is also a short drive from the buzzing medieval Old Town of Budva (2-3km), the UNESCO protected Kotor village and its breathtaking bay (30km), and Skadar Lake (25km), one of the biggest habitat of bird species in Europe.